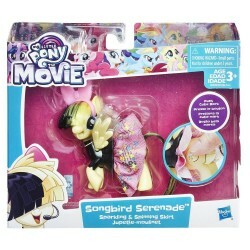 Songbird Serenade is a singing sensation! Inspired by the movie, this 3-inch Songbird Serenade figure wears her outfit like a true superstar. Press her cutie mark and her skirt will spin, showing off its sparkle and shine. Kids can style her hair with her signature pink bow accessory for a finishing touch.